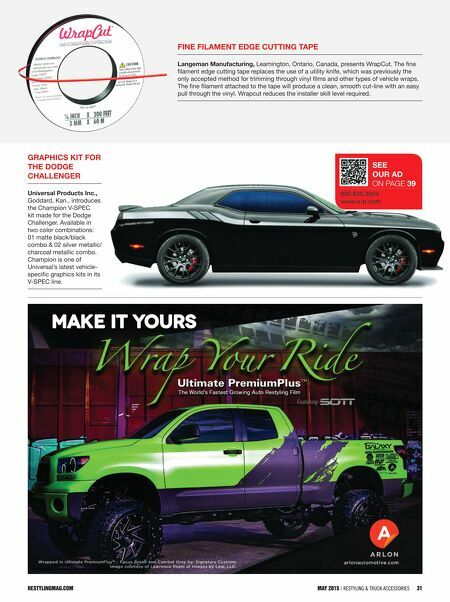 restylingmag.com May 2015 | Restyling & tRuck AccessoRies 31 GRAPHICS KIT FOR THE DODGE CHALLENGER Universal Products Inc., Goddard, Kan., introduces the Champion V-SPEC kit made for the Dodge Challenger. Available in two color combinations: 01 matte black/black combo & 02 silver metallic/ charcoal metallic combo. Champion is one of Universal's latest vehicle- specific graphics kits in its V-SPEC line. 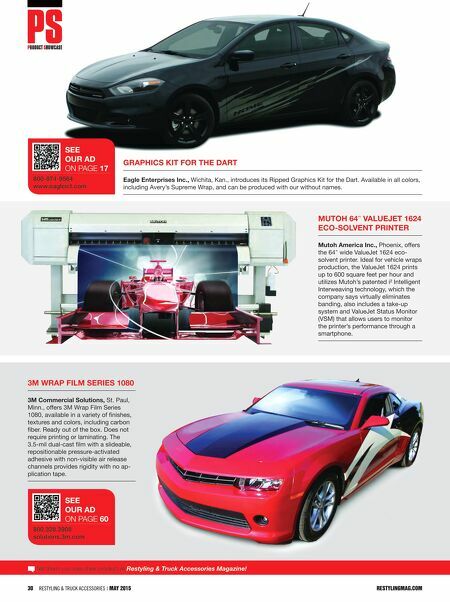 restylingMag.coM May 2015 | Restyling & tRuck AccessoRies 31 800.835.2054 www.u-p.com SEE OUR AD On page 39 FINE FILAmENT EDGE CUTTING TAPE Langeman manufacturing, Leamington, Ontario, Canada, presents WrapCut. The fine filament edge cutting tape replaces the use of a utility knife, which was previously the only accepted method for trimming through vinyl films and other types of vehicle wraps. The fine filament attached to the tape will produce a clean, smooth cut-line with an easy pull through the vinyl. Wrapcut reduces the installer skill level required.